The bronze cory, also known as a bronze corydoras or a green corydoras, is a small, tropical catfish that ranks among the most popular cory catfish kept in home freshwater aquariums. These fish are easy to care for, hardy, and are a little on the shy side. This species is known to live to up to 10 years in captivity. These fish are found in South America from Colombia and Trinidad in the north as far south as the Río de la Plata drainage at the border of Uruguay and Argentina. 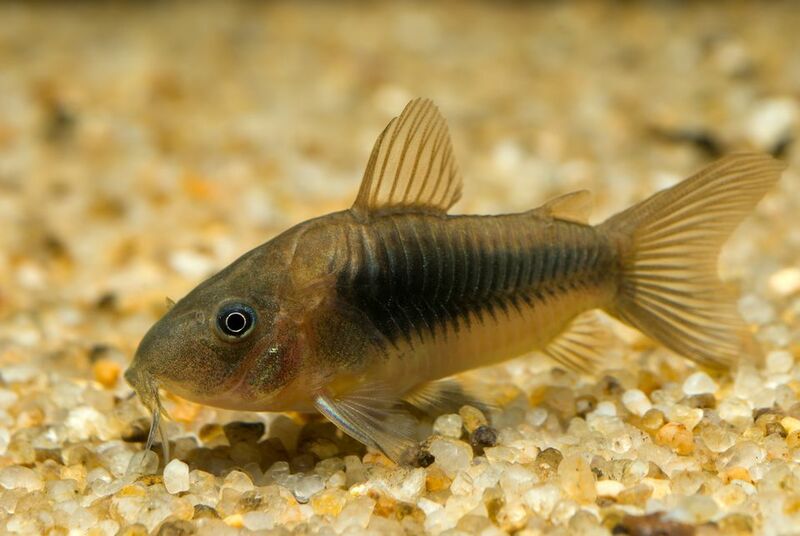 Bronze corys mostly inhabit slow-moving rivers and streams and prefer areas with shallow, muddy water. They have been found in fast flowing rivers to nearly stagnant pond and marshes. They are one of the few fish that can thrive in stagnant water. They have a special ability to breath air from the surface of the water. In the home aquarium, you will often see them darting to the surface to take a quick gulp of air and then dive back down to the bottom. Small, active, and peaceful, the bronze cory is just one color variation of the same species known as the green cory. In addition to color variations of green, bronze, albino, and even black, this species is one of many fish that is sometimes injected with dye to enhance its color. If in doubt, do not purchase any specimens that are suspected of being color dyed. It is also wise to avoid any that have damaged barbels, or those having a sunken belly, which indicates inadequate feeding. Like all corydoras, this species is armored with overlapping scales known as plates or scutes. Their fins possess a leading spine, which can be locked in place to make it difficult for larger fish to swallow them. This spine can make netting them difficult, and care should be taken when doing so. In the home aquarium, these corys are prized for being charmingly expressive. Bronze corys are a schooling fish. Keep them in groups of at least five. Cory catfish tankmates can include most community tank fish as long as they are non-aggressive and friendly in nature. Otocinclus catfish, tetras, swordtails, and other corys can be a good fit. You will not want to put corys in the same tank with oscars, Texas cichlids, or Jack Dempseys. They can injure corys or may eat them. Bronze corys tolerate a wide variety of water conditions. However, they prefer an acid to neutral pH, soft to slightly hard water, and temperatures in the middle 70s. They are not tolerant of salt and should be moved if the tank is going to be salted. Cories like to dig in the substrate for food. To avoid irritation to their barbels, use small smooth-edged gravel or sand for substrate. They tend to be shy and should be provided with hiding places (preferably of wood or stone), as well as floating plants to subdue the lighting. They prefer low water levels similar to the shallow waters near the banks of the Amazon tributaries that are their native habitat. In the wild, corys mainly feed on small crustaceans, worms, and insects. Bronze corys are omnivorous and will accept everything from flake to frozen foods. To maintain them in good health a variety of foods should be offered, including their favorite live foods: bloodworms, blackworms, daphnia, and brine shrimp. They tend to ignore other live foods that remain near the surface of the water. They are bottom feeders, which can prove to be a problem because other fish may consume most of the food before it reaches the bottom. Owners should observe them at feeding time to ensure they are getting a sufficient amount of food. Males are usually smaller and more slender than the females, particularly when viewed from the top. Spawning bronze corys is relatively easy. Purchasing a half dozen or more young specimens at the same time will ensure having at least one or two breeding pairs. Before breeding, they should be conditioned with high-quality flake foods, as well as fresh or frozen bloodworms and brine shrimp. Water should be on the acidic side. Rainwater is often used to lower the pH; however, care should be taken to ensure that the water is not contaminated with toxins. A large water change (up to 50 percent) with water that is several degrees cooler than the breeding tank, will often trigger spawning. If you are having difficulties inducing spawning, try simulating rain by slowly adding water to the tank using a sprinkler. Normally shy, this catfish becomes amazingly active during courtship. Males will pursue females throughout the aquarium at a breakneck pace, stopping to rub their body and barbels against the female whenever the opportunity arises. Once the female is in the mood, she will search for suitable egg-laying sites and begin cleaning several suitable locations. As the courtship progresses, the roles eventually reverse, and the female begins pursuing the male. Spawning begins in earnest when the pair assumes the classic "T" position, in which the male is at right angles to the female with her head against his mid-section. The male will turn his body so that he can grasp the female's barbels with his pectoral fins. This position triggers the release of sperm as well as one to 10 eggs, which the female will grasp with her pelvic fins. Once fertilized, the female will deposit the eggs at a site she has previously cleaned. The eggs are very sticky and will adhere firmly to the nesting site. Shortly after that, the pair will spawn again and deposit a few eggs each time. This process continues until the female has released all her eggs, which can number as many as 200 to 300. Spawning may continue over a period of several days. Once spawning is complete, the adults should be removed, or the eggs should be moved to another tank where the fry can be reared. If moving the eggs, wait for twenty-four hours before moving them. Eggs are initially translucent but will darken as they develop. In approximately four to five days the eggs will hatch, although that may vary based on the environment. After they hatch, the fry will live on the yolk sac for another three to four days. Initially, they may be fed infusoria or very fine powdered fry food. You can gradually feed freshly hatched brine shrimp and eventually adult foods. Frequent water changes (10 percent daily or every other day) are critical during this growing period.